Piles of garbage litter an unpaved road. Crushed soda cans and ripped cardboard boxes lie among the trash — just steps away from a shelter built out of wooden planks, plastic tarp and old shipping pallets. Volunteers from ImpactHK, a local charity, pause when they come to Ming, exchanging pleasantries with him as they take out two croissants and a Danish from a bag. One of four homeless men who live under this fly-over in Yau Ma Tei, Ming has been on and off the streets for nine years, ever since his wife passed away. He finds part-time work as a cleaner, but doesn’t make enough to afford even a subdivided flat in one of the world’s most expensive cities. ImpactHK volunteers. Photo: Hillary Leung. As the volunteers pass out more food and toiletries to Ming’s “neighbours”, the weight of their bags of supplies is dwindling fast — and they still have a couple more stops to go. “The homeless problem is out of control in Hong Kong,” said Jeff Rotmeyer, the founder of ImpactHK. Two years ago, he and a friend had the idea of helping the homeless in Sham Shui Po, the lowest income district in Hong Kong. They set out one evening and distributed lunchboxes to around 80 people. Now, in that same area, he counts over 130. 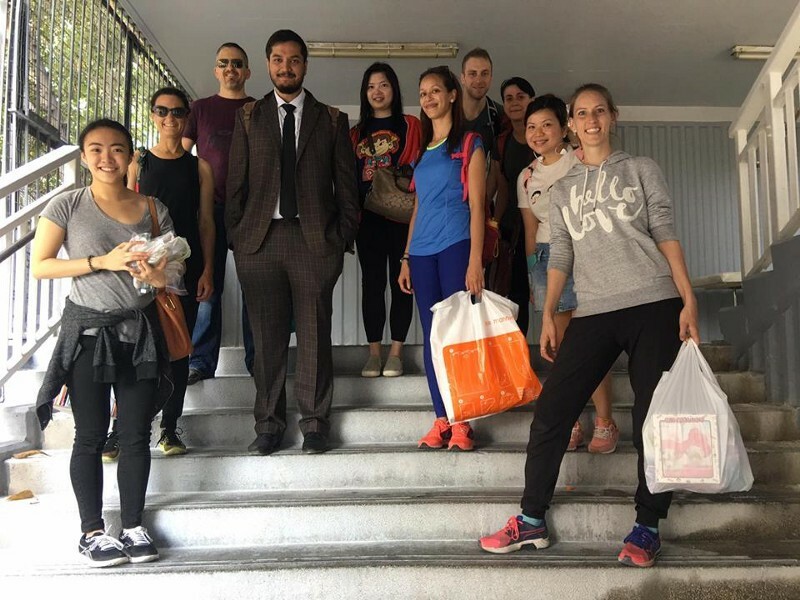 Inspired by the immediate happiness they were able to bring, the Canadian native started the charity ImpactHK, doing one handout a month and inviting friends who were interested to come along. Word spread and soon, the charity was doing two, then four, and now eight handouts — Rotmeyer calls them “kindness walks” — monthly. Financial donations from volunteers pay for the food, toiletries and other necessities that are given out to the homeless along the walks. Toothpaste and pastries may not make a world of difference. But in many ways, ImpactHK is doing something others in Hong Kong, including the government, are not: they’re addressing the homeless as people in unfortunate circumstances, and bringing a little kindness into their lives. A homeless camp. Photo: Hillary Leung. The Social Welfare Department reports the number of homeless people in Hong Kong at just below 900. 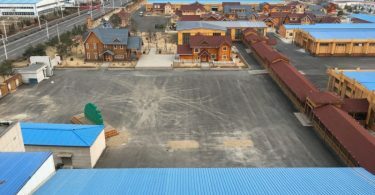 Studies from non-government groups, such as researchers at City University, found more than 1,600 without a stable home. 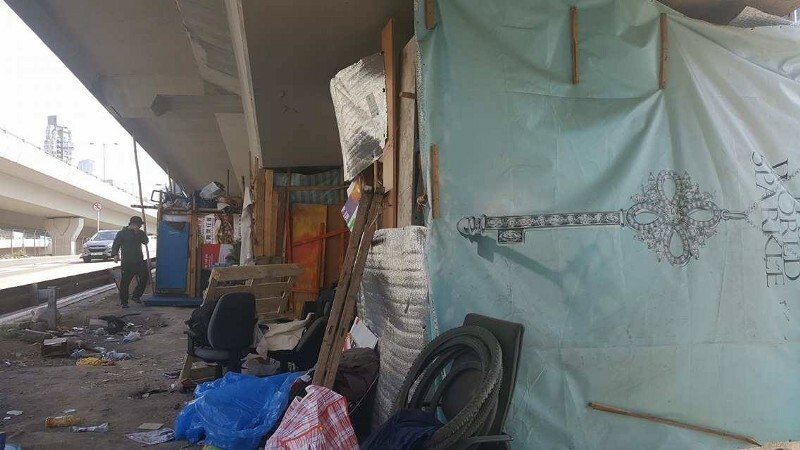 Early last year, five street sleepers sued the government for discarding their belongings, including identity documents, as part of an operation to “clean the street”. They received less than a third of the money they claimed, and no official apology. Homeless shelters exist, but they’re oversubscribed and occupants can only stay six months. Rotmeyer says one reason for the public’s reluctance to help the homeless is the negative stigma attached to them. Homeless people are often addicted to drugs, so many Hong Kong people believe they don’t deserve help. On this particular kindness walk, the volunteers are in Yau Ma Tei, one of several areas of Hong Kong where the walks are now held. The homeless population here is smaller than in Sham Shui Po, but their living conditions are no better. 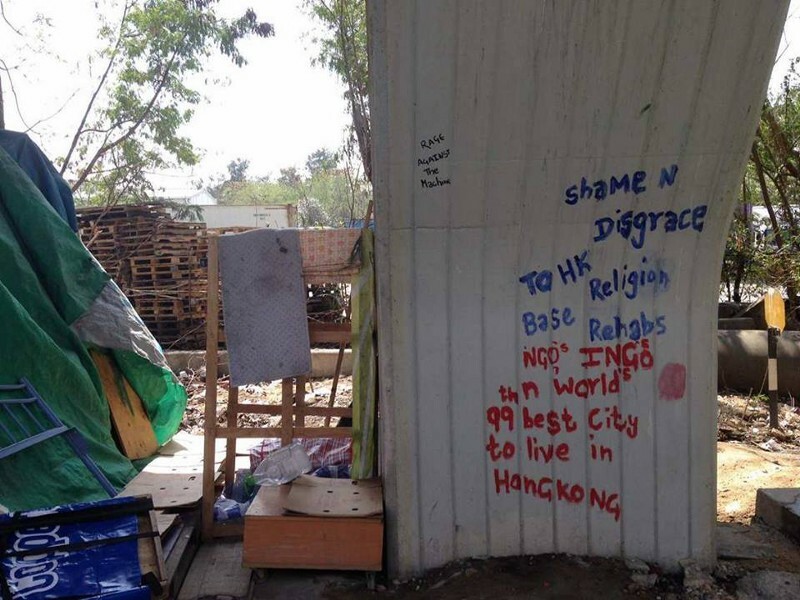 Graffiti under the highway calls out Hong Kong’s poor treatment of the homeless problem in the city. Photo: Hillary Leung. Stawniak had been supporting the homeless in Yau Ma Tei, many of whom live just blocks away from her, even before ImpactHK started leading their walks here. Now, Stawniak attends all the walks — twice a month — in Yau Ma Tei, arriving early each time to buy the handouts so that the group is ready to go when the volunteers arrive. Outside of the walks, she continues to bring the homeless, some of whom aren’t along the walk’s route, food and water when she passes by during her regular commute. The government does hand out monthly subsidies to aid the homeless. 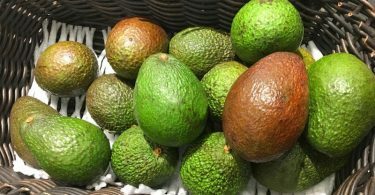 The required assessment, involving residency requirements and financial tests, is long and cumbersome. The amount of subsidy is determined by their age and personal circumstances. Ming receives HK$1,600, which together with his income from his part-time job, is — in his words — just enough to survive. Stawniak hands a towel to a homeless man. Photo: Hillary Leung. “Even public spaces in the city are developed to keep the homeless out,” Rotmeyer says, referring to metal dividers on park benches and pebbled surfaces on footbridges. The government’s lack of concern despite the growing number of homeless people in the city prompts Rotmeyer to think about how he and the volunteers can help this marginalized community. The kindness walks are just the beginning; he speaks ambitiously but pragmatically of a job creation programme he’s working on that will employ the homeless as painters, with training provided. “With painting, they’ll be transforming an old space into a brand new one,” Rotmeyer explains. Aptly called The Second Coat, the job programme will give homeless people like Ming not just a steady income, but another shot at making the life they want. Currently, ImpactHK also runs a free laundry programme for the homeless in Sham Shui Po and hopes to expand it to other districts once other laundry shops get on board. Beyond that, Rotmeyer wants to help those struggling with addiction get a start on drug rehabilitation, and ultimately, to get the homeless off the streets and into permanent housing. A sports league is also in the works.